Setting up a .NET application takes time and sometimes you just want to write a quick bit of code that sends you a Chuck Norris joke via the Twilio API for WhatsApp! So that’s what we’re going to do with the help of Azure Functions. 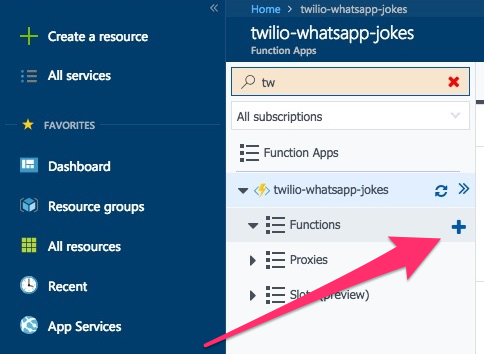 Azure Functions allow you to write code without having to worry about infrastructure or servers, so they are perfect for setting up a simple webhook for an incoming SMS or call from Twilio. From the Azure portal, click the Create a resource button, found at the top of the menu on the left. Search for a Serverless Function App and then click on the matching result. 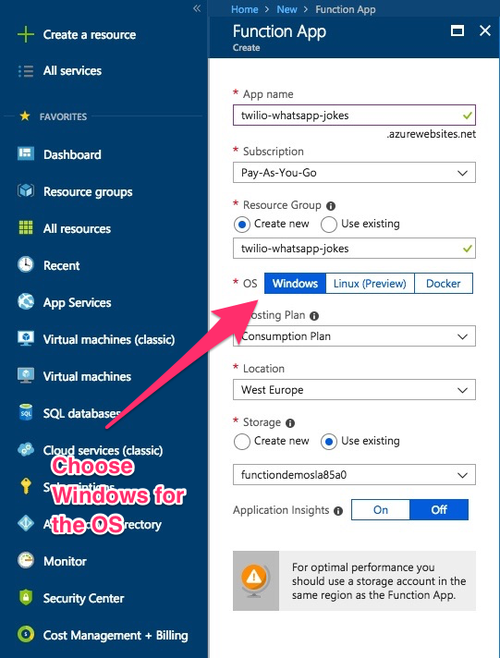 Give your app a name, I called mine twilio-whatsapp-jokes, create or reuse a resource group, and choose the Location that best suits you. You can then click Create at the bottom of the panel. Once that has deployed, go into the Functions from the menu on the left. If you can’t see Functions then click on All services, it’s below Create a resource, search for Function Apps and then click the star to the right of the result to favourite it. Now it should be on the panel on the left. You should see your newly created Function App with three submenus; Functions, Proxies and Slots. Click on the plus button beside Functions to add a new function to our Function app. You’ll be given some options for quickstarts but we are going to create a Custom Function, so go ahead and click on that link. The link will take you to a screen with loads of template types. The one we want, HTTP trigger, should be first, select the link for C#. A panel will slide out from the right of the screen asking you to name your function, do this and then click create. You should now see your newly created function listed under your function app. Click on the Get function URL button and save the URL for later. On the far right, you will see a panel, expand this and click on the View Files tab. We need to add a new file called to project.json enable us to bring in NuGet packages. Once added, copy and paste the code below in and save it. 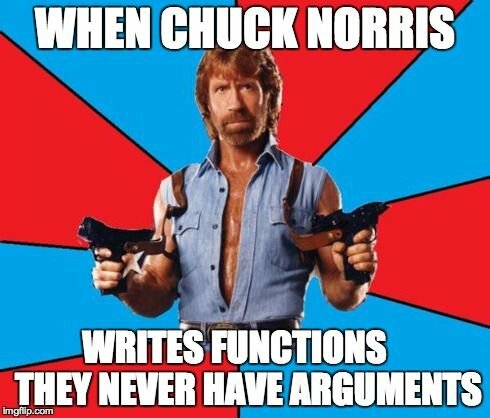 We will need a method to fetch a random joke from the Chuck Norris API, one of my favourite APIs! So, let’s add another file to the function called GetJoke.csx and add the following code. We are using an HTTP client to make the call to the Chuck Norris API. If our mine, is successful, we go ahead and deserialize the returned JSON string to a dynamic object and return the value. Azure Functions come with some external assemblies, like Newtonsoft.json already included, we just need to reference them using the #r "Newtonsoft.Json" notation. This also means we don’t need to add them to the project.json file. Click on the run.csx file. This is our entry point so we will handle the incoming API call here. Update the file with the following code where we set up our usings. Note how we reference our GetJoke method with #load "GetJoke.csx". Now, all we need to do is grab a joke using GetNewJokeAsync and create a new TwiML response to return our joke. Now that we have our working function we can add the function URL we saved earlier to the Twilio API for WhatsApp configuration, under A Message Comes In. 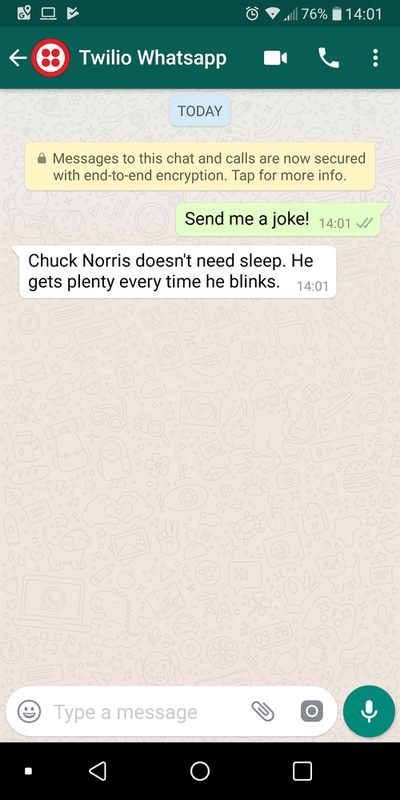 Send your message to the Twilio WhatsApp number and you should receive a random Chuck Norris joke. Your day has now been made! Well, an improvement on this app would be to text in a joke category and then return a joke that fulfils that. You can check out one of my other Chuck Norris projects to see how you might do this and this blog to see how you can extract the message body from the request. Azure functions are great for small sections of code that you want to reuse across different projects like token generators for example. Azure functions on the Consumption plan will scale automatically so they are also great for high load, sporadic jobs. Let me know what cool ideas you have for Twilio and Azure functions and feel free to get in touch with any questions. I can’t wait to see what you build!